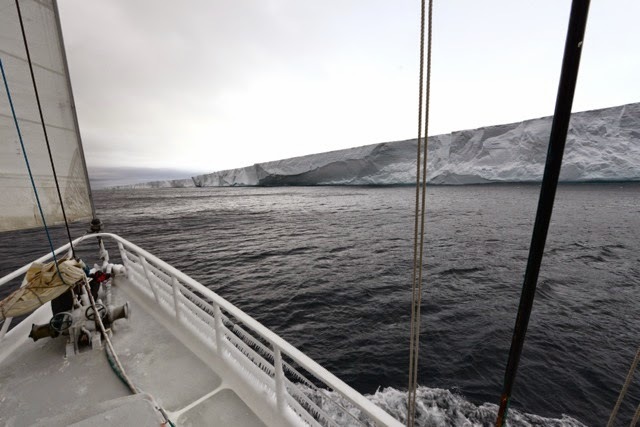 6pm : We just arrived at Zavodovski, the northernmost island of the eleven South Sandwich Islands. After passing Stench Point, we are now anchored in a less windy bay between Fume Point and Reek Point, at the foot of Mt. Asphyxia, an almost continuously active volcano (we can smell the sulfur in the air even though it is very windy). Tonight we are expecting 50 knots winds and a big swell, so we will probably move anchorage in the middle of the night to find a more suitable place. Even though James Cook called these islands “the most horrible Coast in the World”, it is home to two million chinstrap penguins! We hope to see some of them tomorrow – weather permitting. We are still on the boat in Possession Bay right in front of the glacier. It continues to be very windy (30-40 knots at sea level, gusting 50+) and it seems worst in altitude so we are waiting for now. If the weather calms down a bit, we are ready to go up to our former camp and retrieve our equipment. If that is accomplished, our plan would be to leave early tomorrow morning Tuesday to resume our traverse of the island. Wind clocking at 55 knots! No improvement in sight. Abandoning plans of going in the mountains today. We arrived last night in Grytviken, the largest town on South Georgia (population 20, mostly scientists and government ;)). Unable to stay in the mountains because of the current weather conditions, we decided to go to Grytviken where we obliged to officially register with the local government. Our plan now is to leave from here by boat tomorrow (Sunday) and go back to Possession Bay were we will arrive in the evening. On Monday, we plan to go back up the abandoned camp with small snow shovels to recover our equipment which is probably buried under snow (we have the GPS coordinates of the camp so we can find it again). We will get our pulkas ready for an early departure from camp on Tuesday morning. Today we visited Grytviken, essentially a collection of rusted old industrial buildings and shipwrecks: Grytviken was a whaling station between 1904 and 1964. Originally we planned to visit Ernest Shackleton’s grave at the end of our adventure but fate had it otherwise. Since we were already in the town, we spent time today in the tiny church cemetery where his grave is located. Our team of nine in the attached photo on Shackleton’s grave”. We have been anchored in King Haakon Bay (south west corner of South Georgia) for a few hours. This is the bay in which Shackleton’s wooden boat the James Caird landed on April 19, 1916. The team landed on the beach by 9am with all our gear. We immediately loaded our sleds and backpacks and were ready to go by 9:40. The visibility is good but a bit windy. We leave our skis on our sleds as the first part of the climb is rock and packed snow. We aim for the Shackleton pass, a gentle slope of 300m alt. that we reach by noon. Up there it is very windy, probably 25 knots. The visibility is good and we have a very nice view of Possession Bay on the northern side of the island. We decide to push forward to our planned next camp that we should reach by 4-5 pm tonight. The wind is getting stronger and almost directly in our face, slowing us down tremendously. It becomes more and more difficult to progress: at 2pm we decide to continue forward for another hour but are ready to turn and head back to Haakon Bay if needed (it would be easier because it is mostly downhill, although it is not easy to go downhill when you are pulling a sled behind you). After 30’, we realize that to continue would be very difficult, risky and dangerous. So we decide to set up camp for the night. We need to build snow walls, sawing blocks of snow from the ground which is a very long and tiring proposition. We decide to use only our ‘tipi’ tent because it is easier and safer if something should happen and all nine of us can fit inside. The bad news is that it is very windy with no sign of calming down (gusting 50 knots = 100km/h). The (relatively) good news is that we are less than 2km away from Possession Bay where we could go in the worst case, and wait for the boat to come around the island to rescue us. It takes a couple of hours to get everything organized and in the tent. By 6pm we are all safely inside and start to prepare for food. Bertrand (our cameraman) is also our head snow melter and food preparer. At some point while cutting cheese he nips his finger and blood starts dripping on the white snow; annoying but not too serious. Geraldine prepares a first aid bandage and after 15’ minutes he is ready to cook again! After dinner all nine of us settle into our sleeping bags. (We definitely could not fit a tenth person in here!) The wind is constantly blowing: 30-50 knots and the noise of the tent canvas flapping at high speed makes for a very hard night. On King Haakon Bay ‘beach’, South Georgia. I landed first to be able to take some photos. 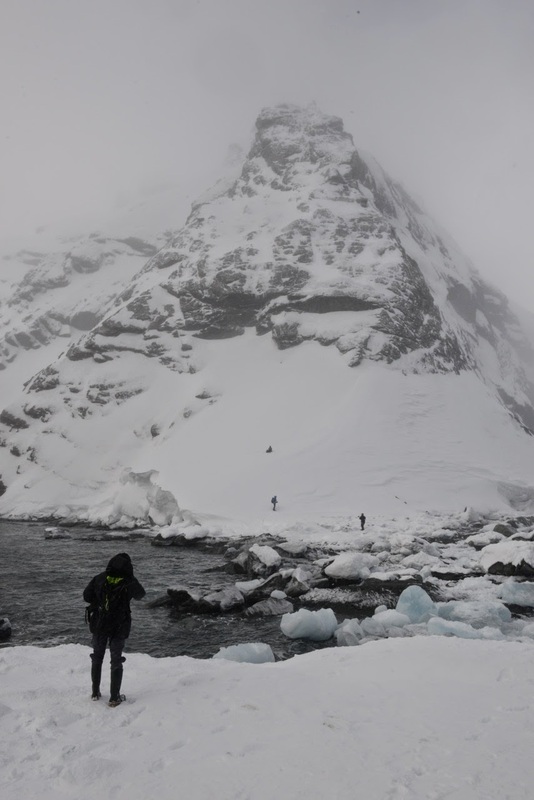 Our team on King Haakon Bay ‘beach', ready to climb up the Shackleton Pass. A pause in the storm after the Shackleton’s Pass. 6:05 pm: We are in sight of South Georgia Island, we should be there in the early hours of the morning, about 3am (it is actually beginning of the day at that hour at that latitude). There seems to be a window of relatively good weather (i.e., winds of 30km/h and snow showers) for the next two and a half days. So we will try to get started early to do most of the island crossing before the bad weather kicks in (100km/h winds, 50cm of snow, etc.). The last part of the crossing is ‘easier’ so we can always camp somewhere and sit out the storm. We will make final decision tomorrow morning in light of what we see on site and the latest weather forecast. We plan on traveling as a group of nine, four British roped together and five French/Swiss together. This is not a competition, so there is no group trying to go faster than the other. We are all one team inspired by the unlikely exploit of Shackleton and his men a hundred years ago. To Endurance! We are up at 5:30am this morning, to take advantage of the sun coming out, with not so many clouds as yesterday. We leave anchorage at 6am and go towards Point Wild, where Shackleton’s group of 22 men camped until being rescued four months later. We arrive at what is left of their ‘beach’ at 10am and go on shore with the zodiac. It is very windy and cold. It is about –17ºC with the wind. A few chinstrap penguins are onshore, along with a couple of fur seals. One of the fur seals is bleeding from the head: fight or accident? I shake hand with David, my fellow Explorers Club member. We are thrilled to be here. After a very long start (stuck in Puerto Williams), we are now relatively lucky with the weather. Zoe goes uphill and takes another sample of snow for micronutrients analysis. We arrive at Elephant Island. The first sight is impressive, but more so because of everything we have read and heard about it… steep icy rock cliffs hidden in the haze reveal themselves as we approach. We decide to go to the southern part of the island as it is already mid afternoon. This is where we will anchor for the night. We will then try to go to Point Wild tomorrow: this is where Shackleton and five of his men left from on the James Caird lifeboat with the hope of reaching South Georgia. At 4pm we reach point Lookout, our anchorage for the night. We get a zodiac out and we go onshore. There we are (sort of) welcomed by a colony of several hundreds gentoo penguins and several fur seals. Zoe takes samples of snow in a virgin slope (these samples are then brought back to her lab in France for micro nutriments analysis). We film all this and then Bertrand (cameraman) goes with Geraldine up the glacier for a test snowboard ride. When all done we return to the warmth of the Australis. We continue on our way to Elephant Island. All is well on board. Outside the weather is hazy and chilly but relatively quiet. At 11am, our first alert... Whales: three humpback whales. We slowed down to observe, enjoy and photograph/film. Every once in a while they come up to the surface to breathe and show their magnificent tails. Orange stuff also come to the surface – it’s whale pooh! The orange color is due to all the krill they’re eating. At 1:55pm, another alert…. 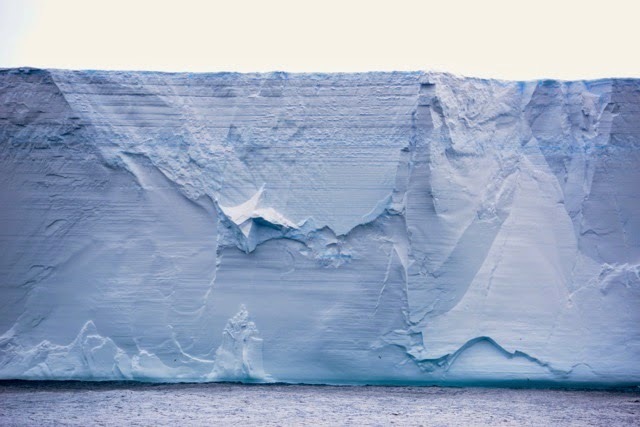 Iceberg: a large one, approx. 100m long at sea level. A couple dozen Chinstrap Penguins enjoy the slopes of the iceberg and many are swimming around in the water. At 3pm, we see Elephant Island for the first time. Actually what we see through the thick haze is just a shadow in the distance. We are on our way to Elephant Island. We are scheduled to arrive there tomorrow afternoon. Not sure yet what we will find there as we have received reports from the government of South Georgia Island that there is a lot of ice around Elephant and the South Sandwich Islands this year. This would not necessarily mean that we cannot land but it would make things more complicated. 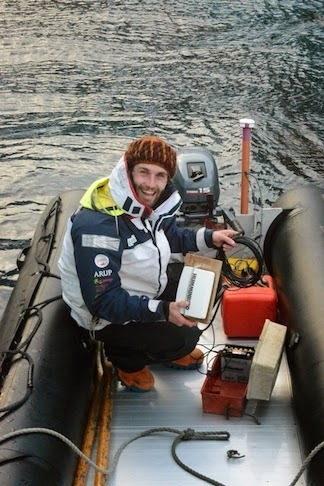 If at all possible, we will use zodiacs to reach the ice and then walk. More on this subject tomorrow night. Yesterday was definitely the worst day at sea. 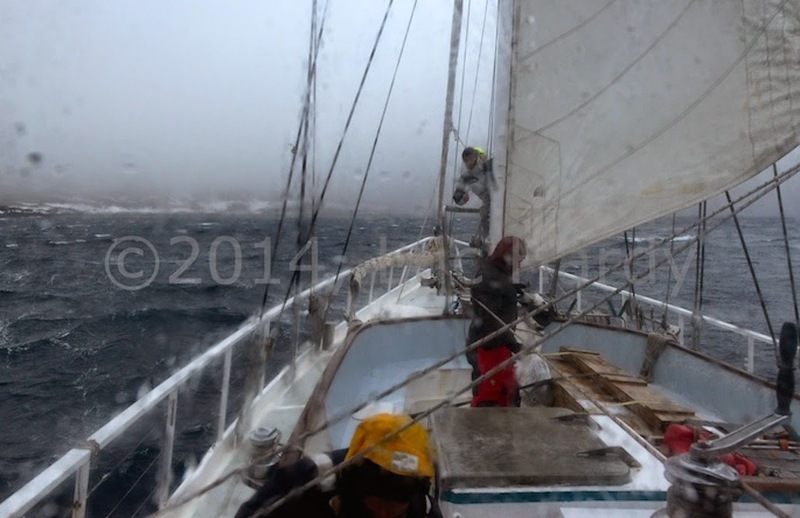 At Cape Horn and in the middle of the Drake passage there was a constant 40 knot wind and a 6-10’ swell which was enough to impact almost everyone on board. Water was constantly flowing over the boat’s bridge. We tried every brand of pills and devices to combat sea sickness but the majority of us rested horizontal for most of the day, surprisingly asleep! Only the crew and Ben seemed to be impervious to the choppy seas. Today is much calmer with winds of only 10 knots. We are all getting up slowly. Same for the albatross that were flying everywhere around us yesterday. Today they are probably relaxing somewhere too since there is much less wind. 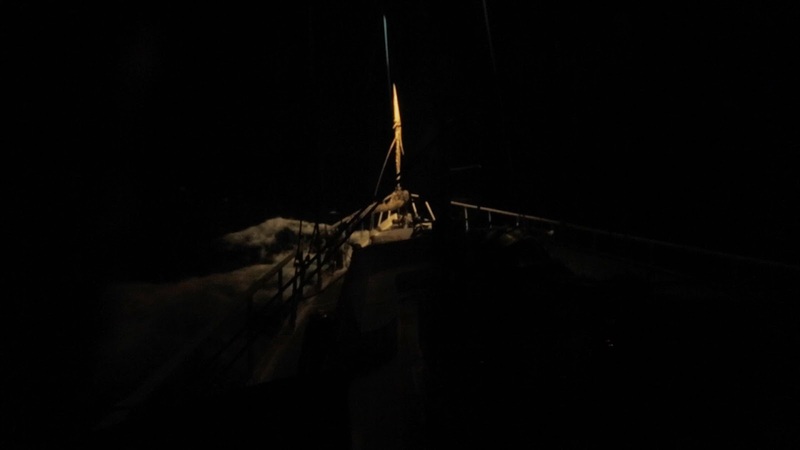 Passing Cape Horn, at night, Oct 15 40 knot wind and 10' waves. 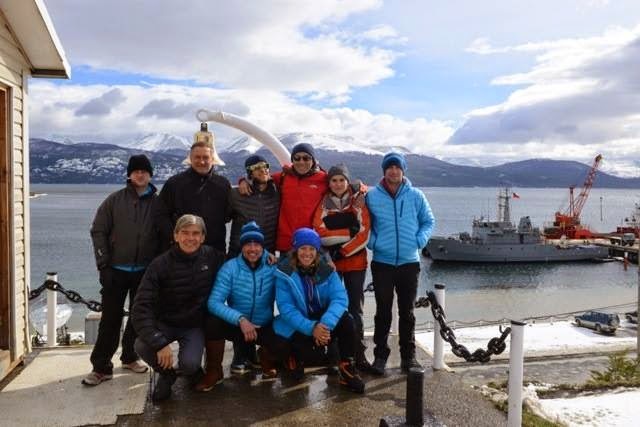 After two days in Ushuaia, the team left yesterday night at 10pm EDT hoping to reach Port Williams in Chile during the night (after 4-5 hours of sailing). The last two days where very useful to get ready for departure: purchase of food supplies for 5 weeks, science seminar at CADIC part of CONICET (NSF equivalent in Argentina) where Zoe explained what she is going to do in terms of science. A part of the equipment arrived two days late (snowboards, skis and traveling benches for filming, etc.). They just arrived yesterday, just in time for some testing at the local ski station of Cerro Castor. 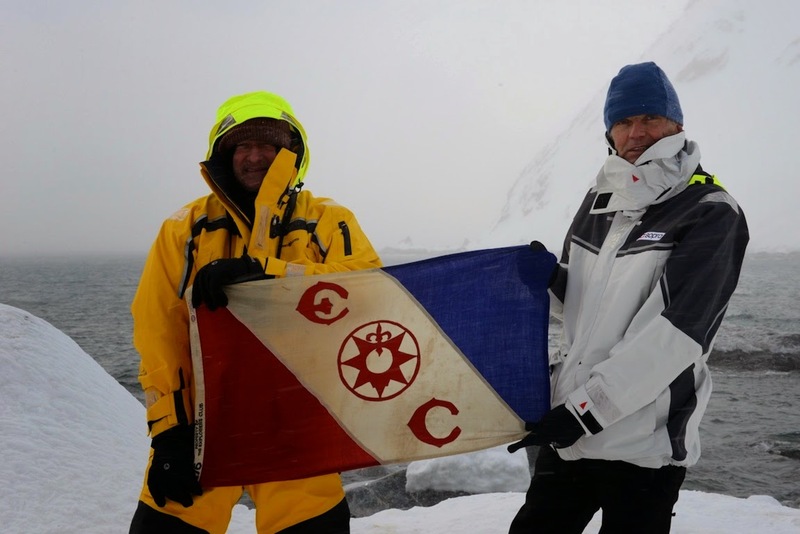 If all goes well, they will start sailing to Cape Horn today, where they might stay a day or two depending on weather forecast for crossing the Drake passage. 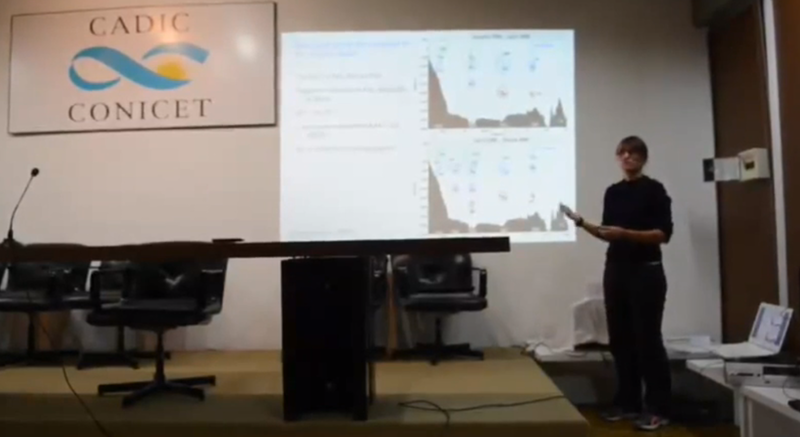 From Zoe:"I did a small seminar at the CADIC CONICET. 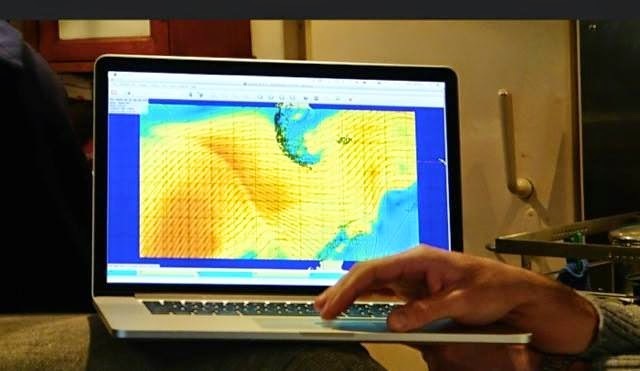 I presented the work done on the Drake project that took place from 2006 to 2009 (LOCEAN,CNES) and then I explained the scientific interest of the Shackleton expedition: the deployment of 11 buoys that will measure temperature and salinity from 2000 meters to the surface”.